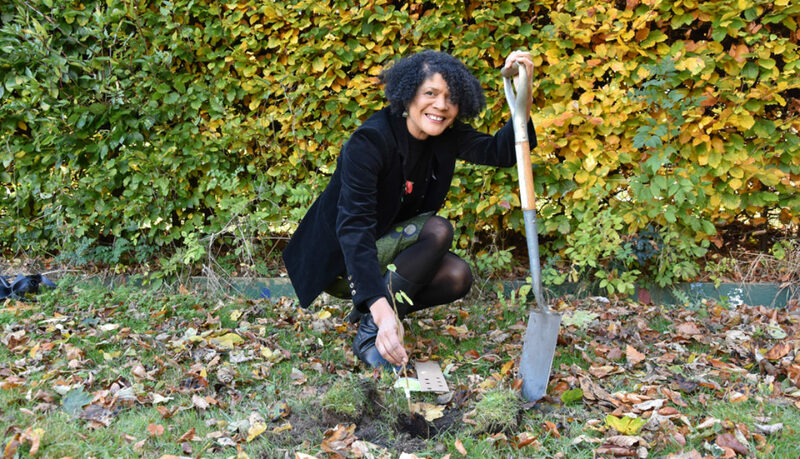 Chi Onwurah, MP for Newcastle Central, has chosen the Nuns Moor Park Bike Garden to plant her contribution to the Queen’s Commonwealth Canopy tree scheme. Ms Onwurah’s trees, provided by the Woodland Trust, were five saplings, including hazel, silver birch and rowan, and were planted at the Bike Garden on Friday 26 October. “Strengthening the global tree canopy is extremely important in dealing with the impacts of climate change, and I’m delighted Newcastle is part of this Commonwealth-wide initiative”, said Ms Onwurah. The Queen’s Commonwealth Canopy tree scheme is a unique network of forest conservation initiatives, involving all 53 countries of the Commonwealth. 50,000 trees are being planted in the UK.